Jackpot Jinni Video Slot Review - Casino Answers! Jackpot Jinni is a 5-reel, 18-line video slot developed by Slotland Entertainment, featuring a wild symbol, a wild multiplier, scatter wins, a free spins feature and four progressive jackpots. You can play the Jackpot Jinni video slot at Win A Day Casino. Jackpot Jinni is a nickel slot. Bets on the Jackpot Jinni slot machine are $0.05, $0.10, $0.40, $1 and $2 per line. You can play up to 18 paylines per spin. Use the numbers on the left side of the reels to select your number of paylines. The maximum total bet on the Jackpot Jinni slot game is $72 per spin. 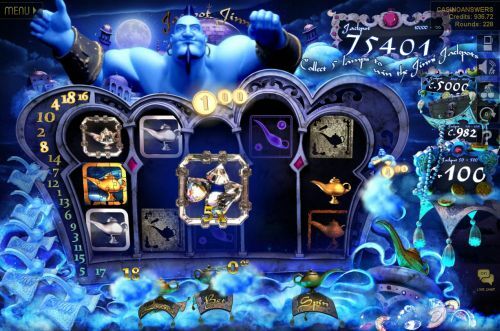 The Jackpot Jinni online slot has a good betting range that should suit most online casino players. To play Jackpot Jinni, select your bet and press the “Spin” button. The Lamp symbol is the regular wild symbol on the Jackpot Jinni slot machine. It will substitute for any non-scatter symbol on a payline. The Jinni symbol is a wild multiplier symbol, so not only does it act as a wild symbol, but it will multiply your winnings. One Jinni symbol will act as a 2X multiplier, two will multiply them by 3X, three will be a 4X multiplier and five symbols will act as a 5X multiplier. The scatter symbol is the Cash symbol. If you hit a Scattered Cash symbol anywhere on the reels of the Jackpot Jinni casino game, you will win the cash bonus. The cash bonus is 5X your bet per line. A bet per line of $2 can win you a scatter win of $10. You can win big from cash bonuses on Jackpot Jinni at Win A Day Casino! Jackpot Jinni not only features the regular Win A Day progressive jackpot, but three other Jinni Jackpots! These jackpots will all increase as you play. Whenever a jackpot is hit, it will be reset to its starting value ($10, $100 or $500 for the Jinni Jackpots). To trigger any of the jackpots on the Jackpot Jinni video slot, you must trigger the free spins feature. If you win $50 or more, you will win the first jackpot. If you win $500 or more, you will win the second one. By winning $2000 or more, you will win the third Jinni Jackpot. Finally, if you win $10,000 or more, you will win the Win A Day Progressive Jackpot, which is at over $75,000 at press time. The Jackpot Jinni video slot has a basic autoplay mode that you can use to play many spins with minimal effort. Click the arrow symbol near the top right part of the screen to open up the autoplay mode options. You will be able to select 5, 10, 25, 50 or 100 autoplay spins. You can speed up the gameplay by skipping animations on winning combinations. Triggering any feature will interrupt the autoplay mode. You can stop Jackpot Jinni autoplay mode at any time by pressing the autoplay mode button. Jackpot Jinni offers a very good free spins feature that can lead to one of the greatest wins of all – a progressive jackpot win! In addition to that, there are lots of other little things such as wild symbols, multipliers, scatter wins and lots more! You can play the Jackpot Jinni online slot when you sign up today at Win A Day Casino. How do I win the Win A Day Progressive Jackpot on Jackpot Jinni? To win the progressive jackpot on the Jackpot Jinni slot game, you must win $10,000 or more during the bonus spins feature. 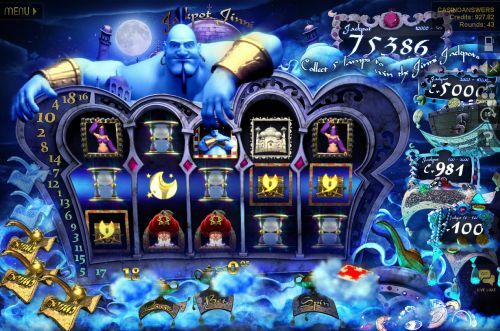 To trigger the bonus spins feature, collect 5 Jinni Lamps during the regular slot game. Can players from the USA play the Jackpot Jinni video slot for real money? Yes, American players and players from around the world can play the Jackpot Jinni slot machine at Win A Day Casino! Can I play the Jackpot Jinni casino game for free? Yes, all games can be played for free before you make a deposit at Win A Day Casino.